Groundhog Day is right around the corner and legend asks, "Will he see his shadow?" If the groundhog sees his shadow, he gets scared and runs back into his hole in the ground, giving us six more weeks of winter. I don't believe in groundhog forecasts, but it's a fun media stunt. . . well maybe not so fun for the poor scared creature that is surrounded by the camera crews. This week's musical challenge is to find songs with "shadow" in them. An obvious one, from my childhood, comes to my mind. I'm sure others in our group will think of this one, too, but here goes Cat Stevens with "Moon Shadow." In looking for "Moon Shadow," I had a choice on what to post. I could post a blurry tape, words on a moon, Spanish subtitles blocking the picture, or the whole dang concert with Moon Shadow being the first song. I chose the whole dang concert but only listened to the first song. Hopefully Cat Stevens doesn't do anything horrific later on, but I wouldn't know. Whether the groundhog sees his shadow or not, spring will still get here, so I'd like to show you my newest spring product. 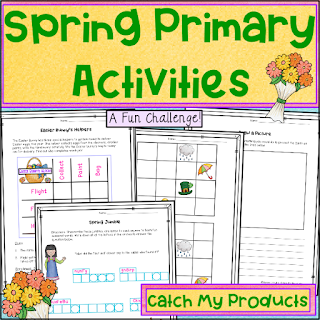 Spring Primary Activities is now available for sale at Catch My Products! 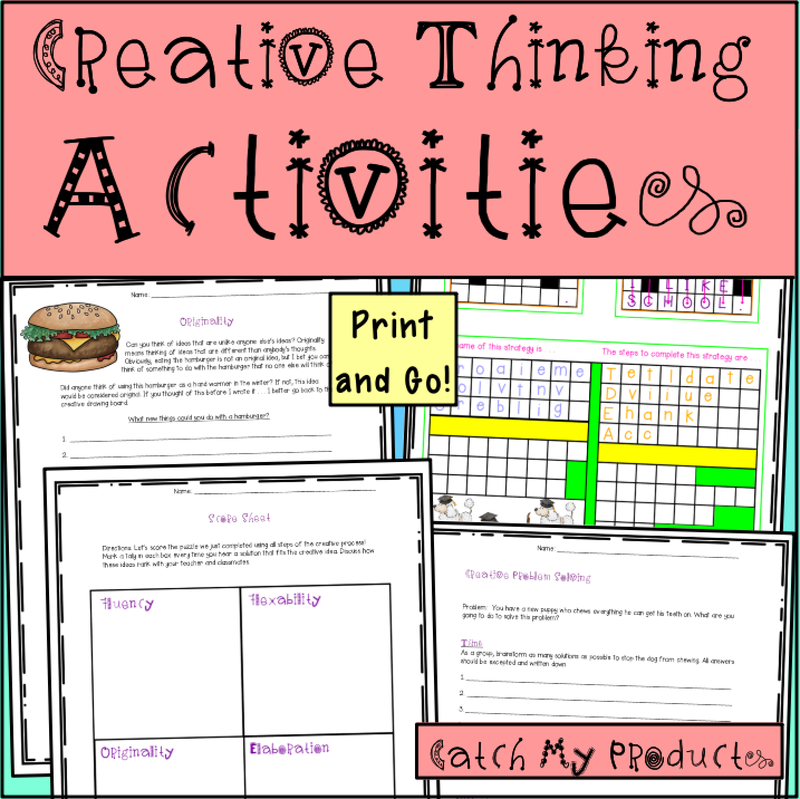 When spring is right around the corner, and you have nothing fun and challenging for your class, here is just what you need. 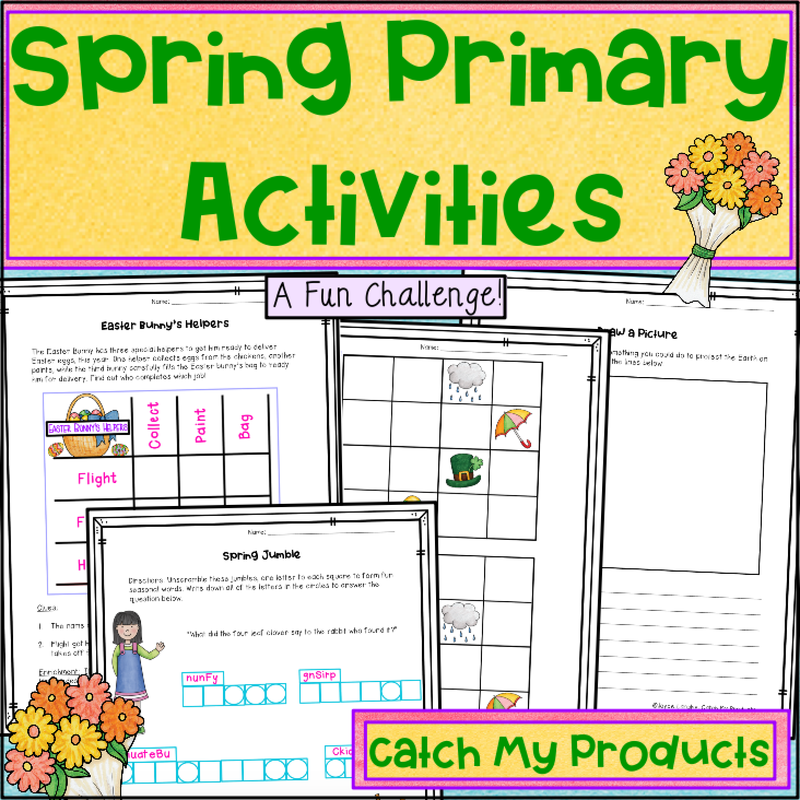 Your kids will have a lot of fun with this Spring Activity Pack! 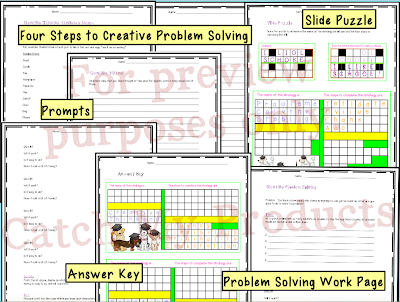 This resources is especially good for your gifted and talented primary students or early finishers. 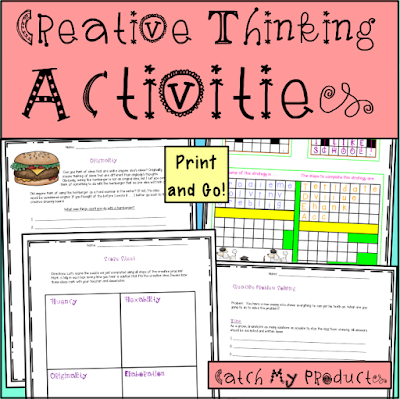 Logic puzzles involve higher level, critical thinking skills, and are great for early finishers, for use in centers, or even to reward students with a fun and engaging activity. Students may complete these problems independently or in cooperative groups. I've been selling products on Teachers Pay Teachers since 2013. I have to admit, some of my early products are not too good, and I've been working on updating these. In fact, I'm so unhappy with some of these early products that I cringe when they sell. 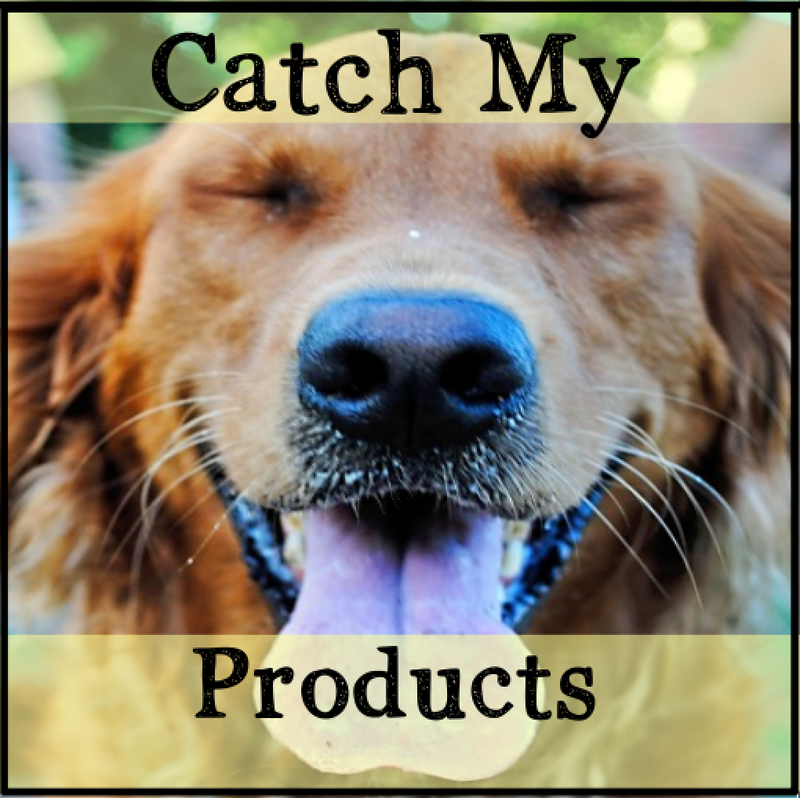 I have found two similar dollar products that are in the works to be something new and wonderful! While one of these will be deleted from my store, the other will gobble up the deleted product along with many more pages added on. So here's the deal. This new twenty page product will sell for $4.95. Anyone who bought the bad product for $1 will have access to the newly revised copy once I download it. If you trust my work, go on and buy the horrible product for $1. Although, you must promise not to leave a rating until the new, more expensive product is downloaded! 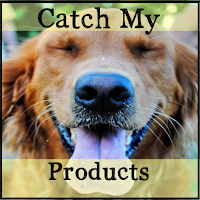 Here is a link to the "crappy" product. It doesn't even have a cover. I am in the process of printing out my revised product and looking for mistakes. After that, it will be posted on this link and available to you . . . after only paying $1. Not a bad deal! But, PLEASE, do not leave a rating of the old product!! That's the promise. If you trust me to post the revision, I'll trust you not to destroy the product with a low rating of what exists now. I hope you'll save money by taking advantage of my secret! Please note, a poor rating will force me to post the new product on the page about to be deleted. That would be totally unfair to the buyers. However, if that happens, email me at: jlansky@comcast.net, and I'll make things right, as I always do. Guess what? In proofing this product, I caught and fixed my misspelled word, "flexibility." Did you catch it? That's why this product is not yet listed, but I believe it's ready, now, so get it for a dollar, quickly. By the end of today (Friday), the offer will probably be gone. Our challenge this week is to play an Elvis tune and then to play a tune from the same era. Here is an Elvis tune. Enjoy that hunka, hunka, burning love! For my first error song, here is Elvis, again. Do you like my error songs? Here's another for the king.